Seam rippers. Stilettos. Not the kind you wear. You probably use one more than you’d like, and most of us don’t use the other as much as we could. One is necessary to have, the other is beneficial. Both help with piecing beautiful blocks and quilts. While I like to pretend that I rarely need a seam ripper, it would be bad sewing karma to push that too hard. The reality is that I have several quilts that I essentially made twice because I did so much un-sewing and re-sewing. My personal record is having to remove the same border three times because I kept getting pieces switched around. It’s still not right but it wasn’t anything a little Photoshop couldn’t fix on the pattern cover. These are the seam rippers I found in the drawers of my sewing room. The white Clover seam ripper is my favorite. I buy them by the box and I always have an extra box on hand. I like it because the handle fits my hand well, it has a long-ish shaft, a thin point and the blade in the curve is sharp, and it stays that way for longer than most. I like the Seam-Fix and Mini Seam-Fix seam rippers, mostly because the plastic bumpy end really does do a terrific job at removing threads from the un-stitched seam. Genius. The tarnished silver seam ripper was a gift several years ago and while I like it, it’ll never take the place of my Clover. Picking every third or fourth stitch with the tip of the seam ripper is the best. When this is done, pick the thread on the other side and it should pull right off/out. Done. Some people like to hold the strips apart with their fingers and pick the stitches that are in the base of the “v”. It’s not a good idea because the thread can pull on the fabric fibers somewhat as they’re exposed if you pull the strips too much. Now… I have seen folks be able to knick those threads with a small rotary cutter and work their way through a long strip quickly. Color me majorly impressed. And a bit envious. If you can do that, I’m in awe. I can’t… not without cutting the fabric and a couple of fingers in the process. 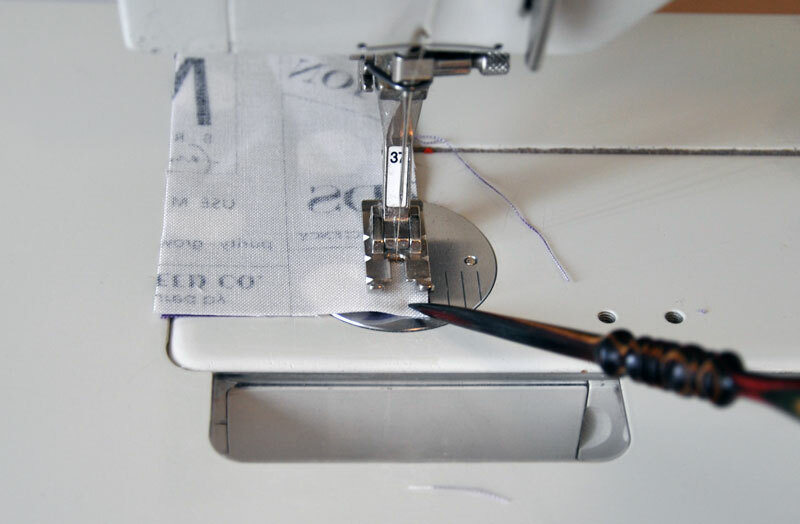 Most of the time, I “un-sew” seams by inserting the inner curve of the seam ripper – the “u” between the point and the smaller point with the little red ball – into the seam and using the blade to cut the length of the seam. 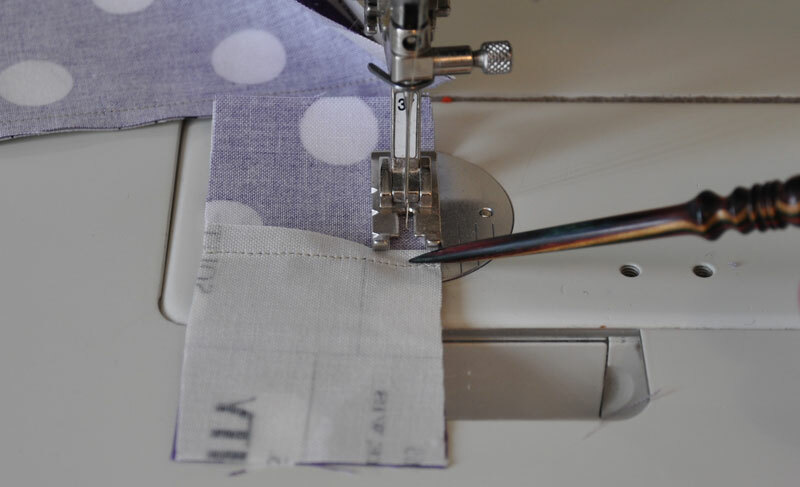 The key here is to do it on a flat seam like this one – not one that has been pressed to one side or open. If necessary, press it back to this. I hope you’ll forgive me but I couldn’t figure out how to take a picture and use my hands to hold the fabric and the seam ripper all at the same time. A couple of warnings here – be careful with looser weave fabrics, seams stitched with very small stitches and back-stitches, and slow down when you get to seams. 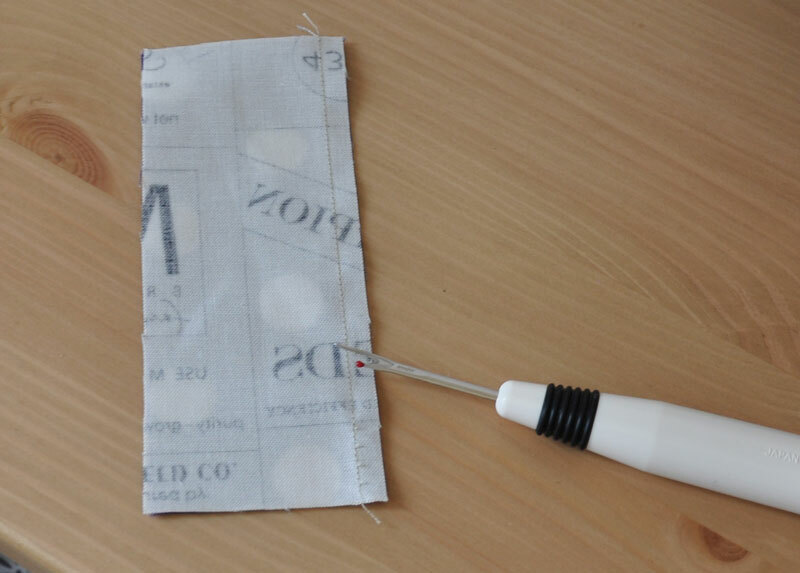 If you’re a little wary of this, try it on a couple of strips of scrap fabric. This is the sort of technique that will help you when you’ve really, really goofed and sewn lots of strips and strip sets together incorrectly. Been there, done that. Stilettos are so much better because they’re about helping you sew, not un-doing a mistake. What?! So I like to try new things… variety is good. This is what the search in my sewing room turned up. Yes, Clover has a stiletto, actually they have two. The one shown here is a tapered awl but Clover also makes an awl stiletto. It’s the same thing – a pointy tool that I can use to guide pieces under the presser foot of my machine. They also make a curved awl that is pretty nifty. My favorite stiletto is one by Collins and it’s bamboo – it’s not shown because I think I’ve already packed it for my trip. 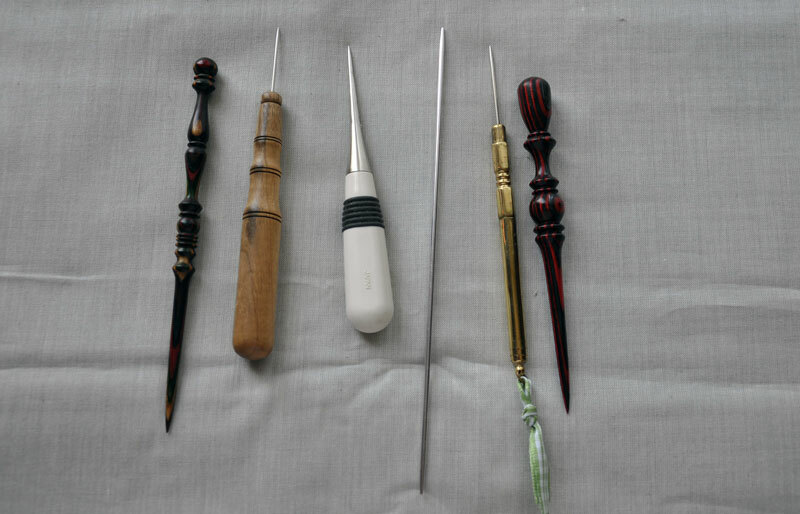 The other things in the picture include a metal knitting needle – I like them because they’re thin and long, a fancy brass one I bought because it was shiny and pretty, and two fancy “laying tools” I bought several years ago on eBay. I use the one on the left the most but truth be told, if I’m going to mangle the tip of something under the needle of my sewing machine, I’d rather it be a $3.00 bamboo stiletto. And just so you know, the goal is not to mangle anything. Stilettos are for holding the fabric where you want it to be as it’s going under the needle. Most of us are a little reluctant to put our fingers too close to that moving needle, but being able to hold onto the end of the fabric as it goes under the presser foot can make a big difference in your piecing. Have you ever had a seam “fish-tail” at the end of the seam, it sort of curves off in one direction? That makes it hard to match seams and points, affects the size of the pieced unit, and so on. Using a stiletto can help with that, especially when the pieces are small. Call me crazy but sometimes I get a better, tighter seam junction when I don’t pin. And if I do pin, I’m supposed to have removed it by now, right? So how do I keep that seam from being pushed back by the presser foot? That’s right, with a stiletto. Using one takes a little practice, mostly because it will feel odd holding it in your hand while you’re stitching. You’ll want to keep putting it down, which means stopping to pick it up when you get to seam junctions and the ends of seams. But I think the results will help make it easier to get used to. wow- I only used the stilleto to turn corners right side out! I am going to try this now. Great post . my favorite stilleto is a cuticle stick! I have broken a stiletto by sewing “on” it. But I do appreciate that it wasn’t my finger! I’ve used a stiletto for years & yes, there is something about using it to hold the seams together that makes a more finished seam than when I use pins. I use fewer pins now for that reason but it does take practice—that is how I began sewing & I do not know the difference! I just use my seam ripper as a stiletto when I need one. Good tip about the fishtailing. Another awesome set of tips! Carrie, you are THE BOMB!!! Love, love, love my white Clover seam ripper(s)! Much sharper than any other brand I’ve used and I definitely do my share of unsewing! I love using a stiletto and mine is an antique hat pin of my grandmothers. A helpful hint. 40 years or so ago , I made a dress and apron in the Holly Hobbit (?) style for Easter. I went so far as to embroider the dress and so forth of the on the front of the white “Pinafore”” using the same fabrics. New mother, new sewer. The very last thing I had to do was open the buttonholes on the back of the pinafore. I used my seam ripper to open the buttonholes, and of course you can see what is coming….the seam ripper slid through the shear fabric, and I had a 2 inch opening! I was distraught. Then I thought, I’ll just reverse the closing and put the buttons on the other side of the closing. I carefully zigzagged the ripped button hole closed, moved the buttons, put in new buttonholes, and when closed, the rip was under the buttoning tab. Interesting tips thanks , but what is the point of the little red ball on the tip ? I had no idea that seam rippers need to be replaced because they become dull — makes sense. Guess what I’ll be buying with my Joann’s coupon this week 🙂 Love all your quilting insights — very practical and helpful! I always use a stiletto … the “Purple Thang” is my go to one but a bamboo stick is my backup. Something valuable that I learned at the last August AQS show in Grand Rapids was at a “talk” by Sue Nichols on her tips for piecing. Quite simple, really. To avoid most fish-tailing you never, ever, EVER lift your hands up off your work until the sewing machine is completely stopped and the needle is no longer moving. I thought it was too simple to work … and it did take repeated patience and practice … but it DOES work. Don’t lift your hands (or stiletto) off your work until your sewing machine and the needle are completely stopped. Fish tailing eliminated!! if there’s a Daiso near you (it’s the Japnaese $1 store, except the price is $1.50), you can find a stiletto for $1.50 in the cooking section–it was labeled as an ice chipper once and something else (takoyaki skewers? something like that) another time. nice wood handle and sharp point–and can’t beat the price! Very well written and understandable explanations. Thanks for the information and tips. I am well acquainted with my seam ripper and I too have used it as a stiletto on occasion. I should use it more often as a stiletto. My favorite stiletto is That Purple Thang! which is about $3 and has a nicely curved tip which is thin but sturdy on one end (which is handy depending upon the application) and a flat 1/4″ square on the other with a slit built in that I use to hang it on a pretty ribbon by my machine, sometimes my neck. I also will use it carefully on my ironing board to hold the edge of a piece while I press, saving my fingers from the heat. I don’t touch it with a hot iron, just let it hold until the iron get there. I have also used it to get fine points pushed out as the tip is just gently rounded and I have better luck with it than a pointy tip object like a knitting needle. The manufacturer doesn’t waste money on fancy packaging, just has it attached to a business card explaining all the cool things that you can use it for. Clever and functional! I like to give them as gifts to young and new sewists and quilters. Thanks Linda H., I will try using my Purple Thang to help with the fishtail! I didn’t know why I got that, thought I just sewed crooked! There’s a little quilt shop in Lake Chelan, Washington where I saw the quilt that inspired me to want to learn how to quilt. I had just gotten my first sewing machine as a gift from my sweetheart after I tried to sew using his great-grandmother’s machine found in the rafters of the shed. This quilt was stunning! I was in awe of the fabric and colors, not even aware that it was almost all applique… I stared in awe at it (still do every Christmas trip when they display it) for the entire trip and finally went inside. I had never been to a fabric store that wasn’t a big chain company in the mall. Oh, I fell in love with the quality of the fabrics! I got quite an education that day. I didn’t have much money so I came home with a few fat quarters from Moda, i don’t recall the name but they were a Valentines theme, a simple table runner pattern and a Clover seam ripper. 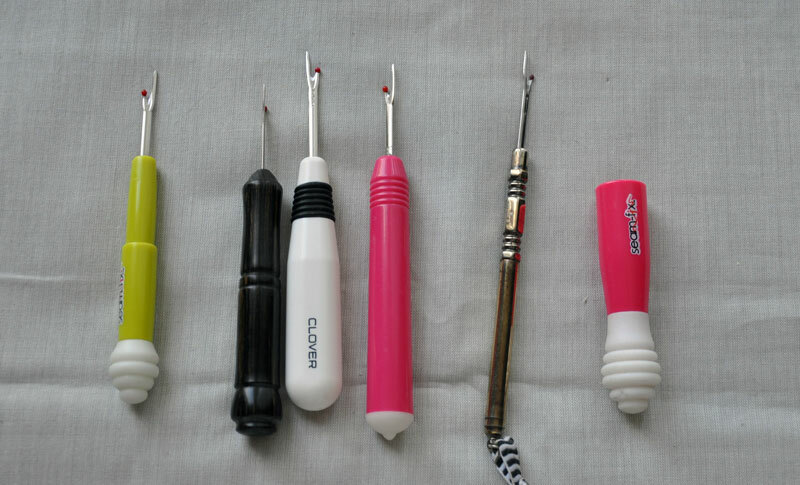 I could instantly tell the difference from the little plastic seam ripper I had always used. Just this Christmas season, that first Clover ripper became dull after cutting buttonholes in a quilt sandwich. I blame the batting. Luckily, I picked up another one and should be good to go for another decade or two. And I grabbed the pattern of that quilt! Last copy they had! I am learning applique now, knowing someday I will find a fabric line that I can substitute and make my very own version of Frolic. I love small businesses and so glad we have quilt shops around today that care about the customer and helping new quilters to get sewing! Bamboo skewers (like you use for shishkabobs) are the perfect tool for a stiletto. If you accidentally get it too close and your needle hits it, the needle will just go through it. If you hit a metal stiletto with the needle, you can have real problems … such as the broken needle flying ‘somewhere’, and your machine possibly being damaged. I use the skewers all the time … they’re cheap to replace if you break one too!